I find it hard to put into words how this remote and wild island has captivated me. So as a substitute for something more poetic, I will make a brief summary of what we saw and give some details which I hope will be useful to the traveler who decides to visit Iceland. Departing from Barcelona (August 2013), we arrived to Reykjavík almost at 01:00 am with Vueling airline. It is about the low cost: ungodly hours of arrival and small seats in the plain. Upon arrival we stayed at the Bed & Breakfast Keflavík Airport, which is five minutes from the airport. I don’t have much to say about the place. To sleep. In its favour one detail: the beds are huge and very comfortable, and if you ignore the noise of the plains could be given a correct score. In the morning, after picking up the rental car, began our journey to north. The destination was Húsavík, a journey that from Keflavík it took about 6 and a half hours, but that with stops along the way became some more. 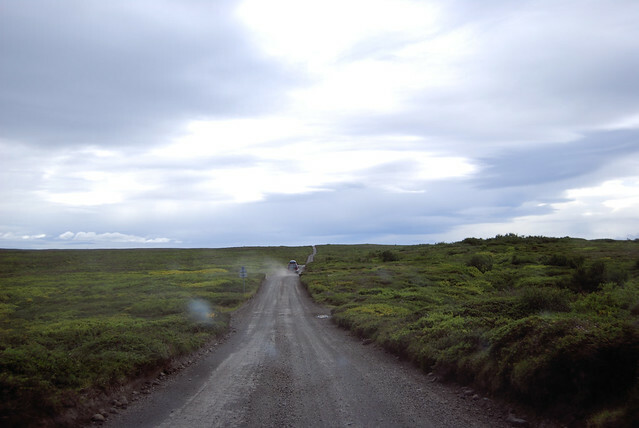 I love lonely roads, and if we add the changing icelandic landscape, we have something perfect. You only have to leave the gray area surrounding the airport (the area had been and old American airbase) to suddenly find a picture that can only be described as spectacular. 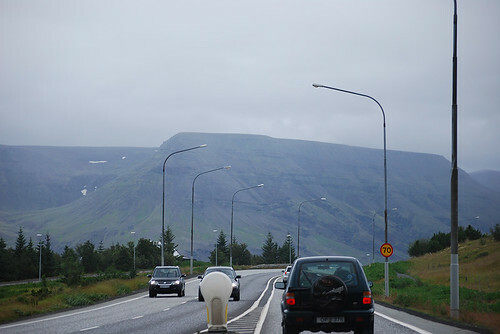 Road near Reykjavík. Road to the north. The first thing I noticed is that in many sections of the road the land is black. A black mixed with an extremely bright green that you normally only see in areas far north. Also, just out of Keflavík you can see those big Icelandic mountains with stunning shapes and sizes. There is water everywhere: small waterfalls, lakes and fjords that are brightening the way around the island. 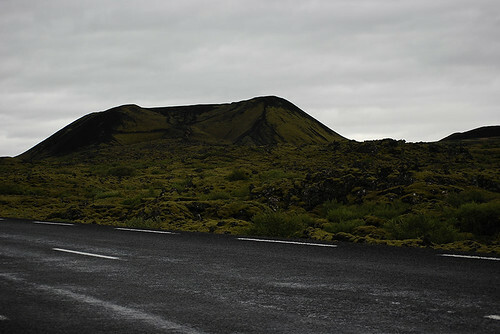 We make our first stop when we see our first lava field, about two hours from Reykjavík. We cannot avoid to start taking pictures of these curious formations, all of them topped with that bright green moss. 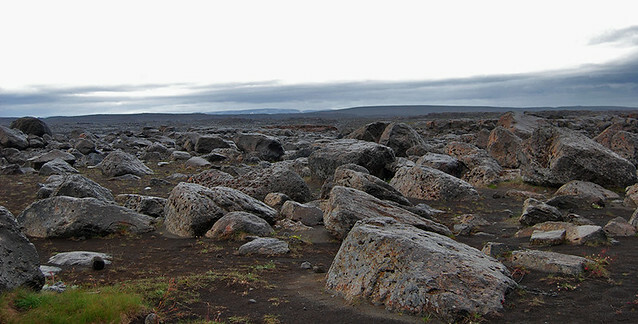 Although Iceland is formed of lava, only about 12% of the surface of the island is classified as lava field. Lava field. Ring Road to the north. 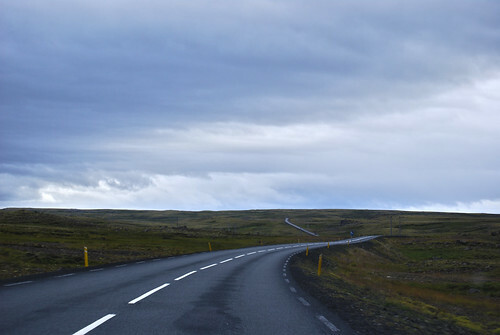 As we take distance from Reykjavík the road is increasingly solitary, and more as we approach to north. In many sections, I look at both sides of the road and I see no sign of human presence. Only pure nature. We pass places with rolling hills and mountain passes too. It rains intermittently, but not enough to make driving difficult. In late August there is no midnight sun. But there is light until late, about 10:30 at night. So before to accommodate in the cabin we decided to walk to the sea. An infernal wind blew, so we got to see the cliff along the sea but not to the beach. Here I leave some pictures. Next day we wanted to visit the famous Diamond Ring. It is the area that impressed me most, maybe because it was my first contact with those landscapes from other planet that you can find in Iceland. 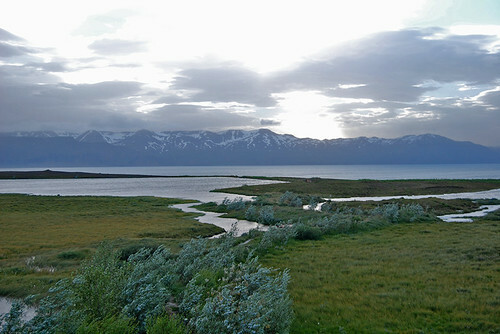 But I will start talking a bit about Húsavík, where we stopped before starting the route. As we didn’t have visited the village we got a pleasant surprise. I can say it is the prettiest village we saw on our trips around the island (Iceland does not stand out because of its architecture). 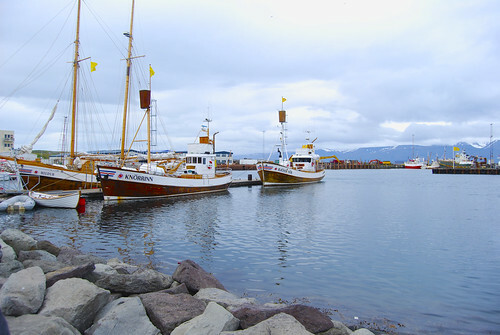 Húsavík is settled in a bay surrounded by cliffs, views that remind something to England and Normandy in the area of the Channel. This point of Iceland has become the mecca of the island to see whales. 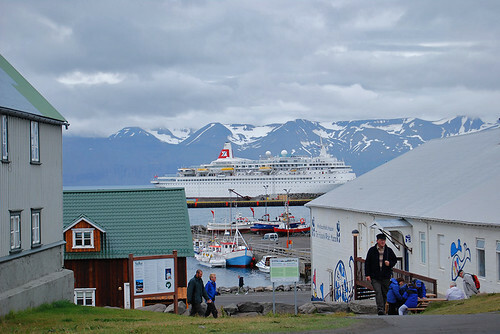 You only have to wander around the port to see many visitors that arrive to Húsavík in search of those sensational mammals. In our case, we didn’t catch any of the “whale-watching”; two years ago we could see whales in a boat departing from Vesteralen Islands (in Norway), so we decided to spend that time visiting other icelandic corners. A part of the whale watching tours, you can visit their the small church, the museum of the phallus, and of course, to take a stroll around the downtown area, mainly the port area. We visited the church and took a walk around the downtown; we left the museum of the phallus (for lack of time and because we didn’t wanted to spend our scarce time watching animal penises). From Húsavík I would like to highlight the history of its foundation, something I read in the guide we had. According to the Guía Azul (Ed. Gaesa): It was truly in this place and not in Reykjavík where the first Viking settler arrived intending to populate the mysterious land of Ultima Thule. It was the Swedish Gardar Svavarsson, an Scandinavian adventurer that anticipated the arrival of the historical Ingólfur Arnarson. He arrived to this place in the year 850, raising a large complex of buildings and naming them as Húsavík, that is bay of the houses. Gardar spent an entire winter in this place, but the following spring he decided to abandon the bay, leaving behind a small group of servants, probably more as a punishment that as a colony to justify its possession of the place. This is why Gardar is not considered one of the pioneers of the colonization of Iceland. 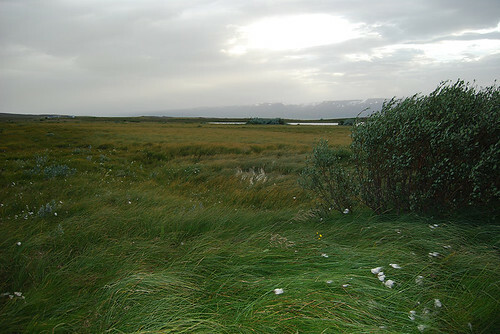 Our next stop of the day is in the National Park of Jökulsárgljúfur, beginning the route of what is known as the “Diamond Ring”. We started the tour in Ásbyrgi, where the information office of the area is (open from May 1 to September 30). Here we bought a map of the roads within the park. Following the route from Ásbyrgi to south, you can choose between two paths, the 862 and the 864. For what I had read in some forums it was worth taking the 862, and so we were told in the tourist office. 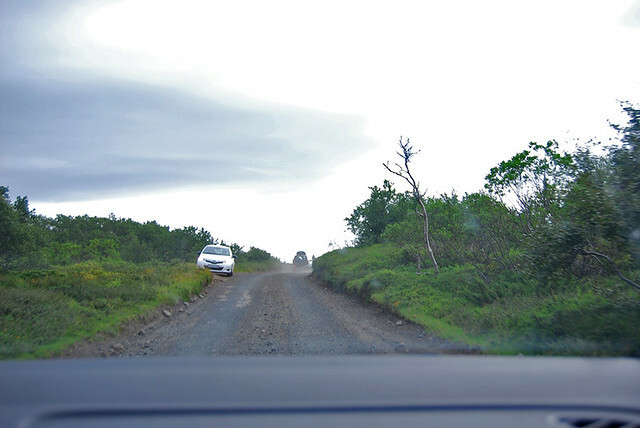 Almost the entire route is unpaved, but normal cars can pass (no need for 4×4). At least at the time we traveled there, in late August. In addition, the 862 has more interesting points to stop and take a route for walk. I don’t have the map we bought digitalized, but I give you an schematic map of the roads surrounding the park. By clicking on the map you can see the characteristics of these two roads in more detail. Our next stop is in Hljóðaklettar. Here we begin to see the grand canyon that dominates the park, one of the deepest in Iceland: 25 km long and 500 meters wide, with a depth of 100 – 120 meters at some points along its lenght. 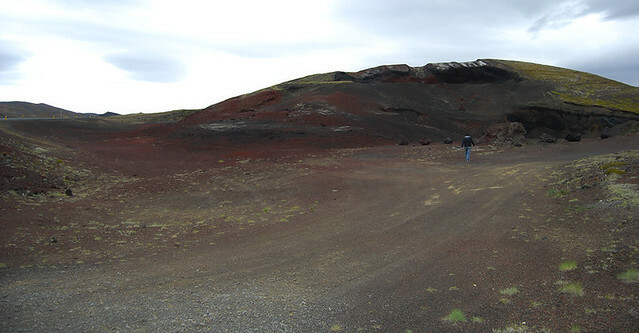 Hljóðaklettar (Echo Rocks) is located in the area called Vesturdalur, where you can take 6 different routes, with varying distances and difficulties. All paths are very well marked, and leave from a parking area where there are picnic tables, a camping area, toilets and potable water. We choose a 3 km route (it’s a circular path) that will take us through basalt columns that form a maze of strange shapes. We only find like 4 persons down the road, so the solitude of the place and the sound of the Jökulsá river against the rocks created a unique atmosphere. 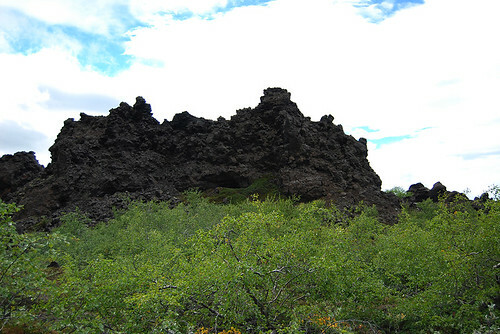 Among the various formations stands the called Kirkjan (church), where the ondulations of the lava created a kind of huge cave. It is worth approaching and reaching the entrance of the “cave” to see its magnitude. 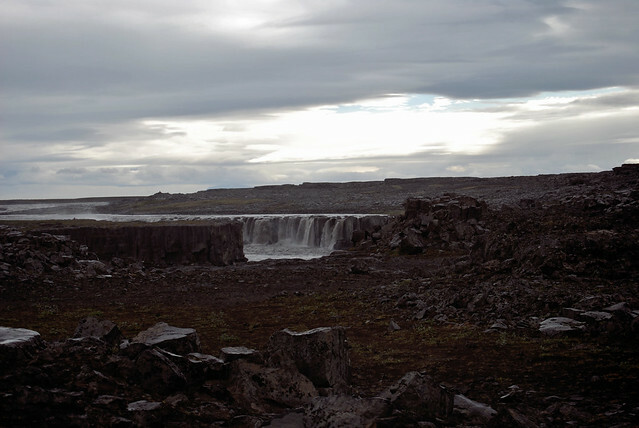 Once we finished the route in Hljóðaklettar and took something to eat in the picnic area, we continue to Dettifoss. From here the road starts to get more and more interesting. Vegetation disappears and everything becomes more arid and rocky. The road remains unpaved, which adds even more sense of unreality to the landscape. I look at both sides of the road and the view is lost in the horizon, there is nothing. This does give the feeling of being in the confines of the world. And we got to Dettifoss, one of the places where the force of nature has caused me more impact. It is really difficult to describe in words what I felt as I approached the mass of water that is Dettifoss. It is worth a visit at least once in life. 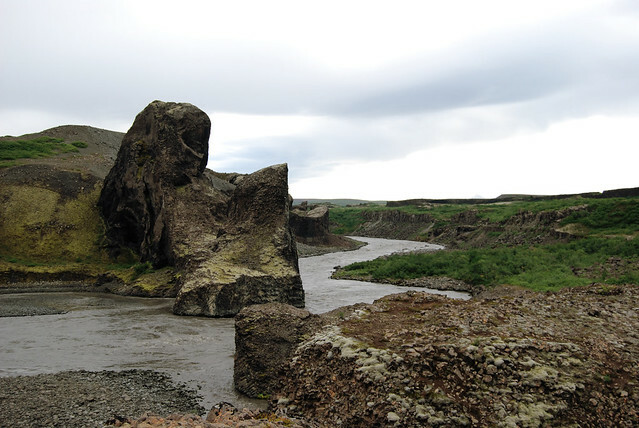 Not only is the waterfall, is also the landscape that surrounds it: the huge rocks that presides over all, the dark earth, almost black, so Icelandic, the impressive canyon. A set that seems straight out of a science fiction movie. Overwhelming. 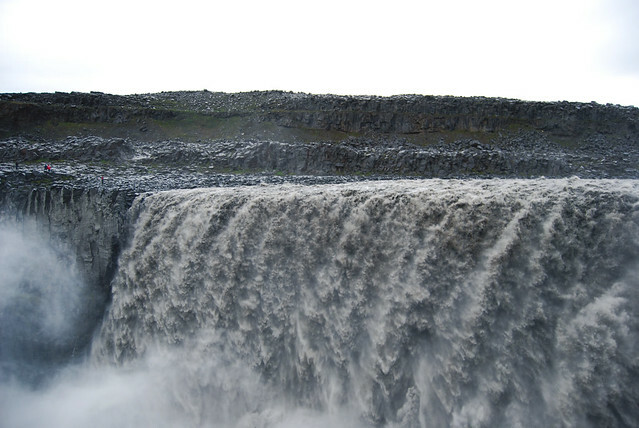 From the 44 meters high of Dettifoss flows 500 cubic meters per second of glacier waters that carries sediments, creating a roar of incredible dimensions. For something is said that this is the most powerful waterfall in Europe. From this side of the canyon, it is possible to approach close the water. Another reason to follow the road 862: it offers the best views of Dettifoss, allowing a more frontal view of it. That would be impossible to do from the other side. It was time to return to Húsavík. We were still impressed with the way back, but the day had been intense, so we continued to our little cabin for a hot and sulfur stinking water. I forgot to comment about the water. In Iceland the hot water smells like rotten eggs. I thought I would get used to, but I was not. The consolation is that more naturally impossible. So you have to ignore the whiff and enjoy the bath before leaving again to the icy wind of the island. 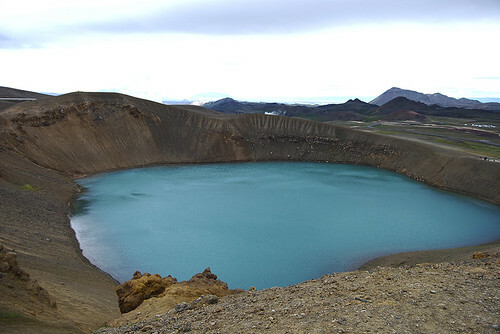 The next day we decided to visit another of the essential areas of the north: the Lake Mývatn and surroundings. We started the visit in Reykjahlíð, having coffe in town and taking a detailed map in the Tourist Office. A tip for those who also travel on their own in Iceland: it is important to have quite prepared the routes you want to do, as in Tourist Offices they give you maps but don’t expect extense explanations. After a watery but comforting coffee we were prepared to leave Reykjahlíð. We left the village behind and 10 minutes later we were seeing Hverir. 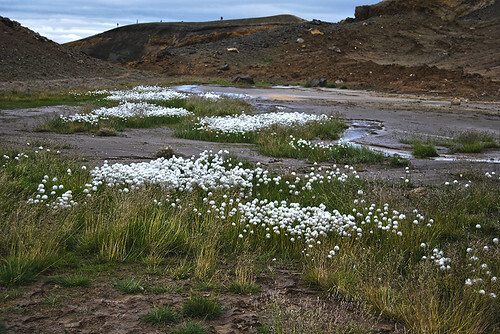 Situated at the foot of the hills of Námafjall, it is the area where solfataras emerge more strongly in the island. These are complemented by boiling springs and mud. As the land can collapse, it is recommended to extreme caution in the area. For this reason there is a way with ropes to avoid surprises and burns (according to the little guide we took in the Tourist Office, more than a person has gone badly burned due to approaching too much where they should not). Just entering that extrange zone one is amazed by the colours of the mountain. 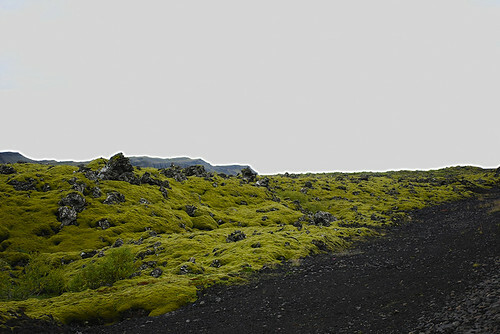 Black, red, yellow, green, blue, brown… there is a whole complex tonality in the Námafjall earth. We left the car and noticed that the wind was even worst than the day before. It’s like to fly. So I understood the guide book recommendations as to the importance of wearing a good windbreak. So we covered well with our hoods to stroll to the Martian soil. There was a quite unbearable sulfur smell. Also it is worth to approaching to opposite side of the mountain. 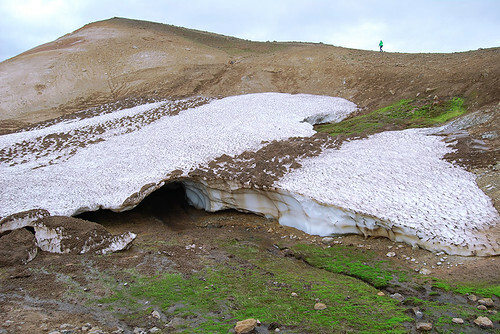 There is a geothermal plant with a pool of white water, that seems something supernatural. The geothermal plants are very important to the Icelandic economy, since 85% of the energy consumed in the island comes from geothermal energy. 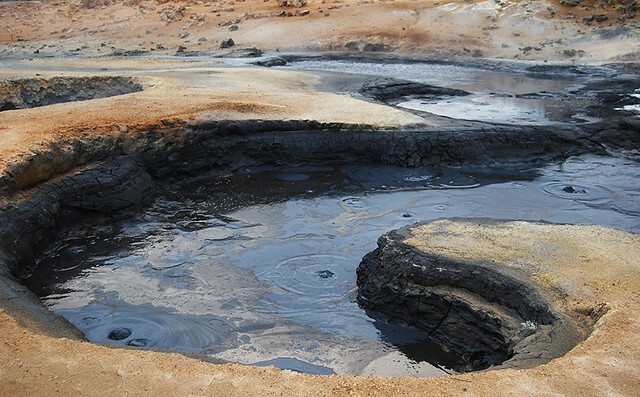 Under Iceland there is a large caldera of magma that allows its citizens to have free electricity and hot water. Our next stop take us a bit away from the road around the lake Mývatn. 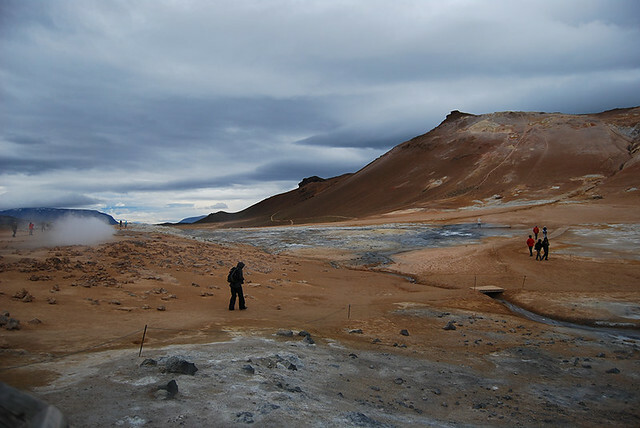 But the visit is a must if you are in the area, accessible and not too far; it’s Krafla, the largest and most active volcanic region of the island. 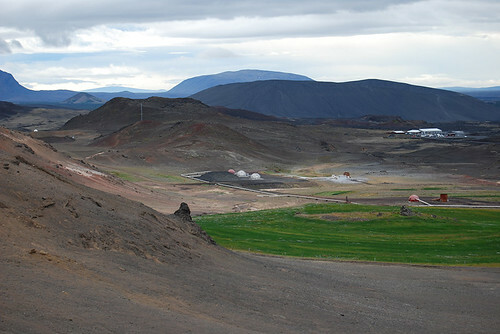 To arrive from Hverir, you must follow Route 1 to the east. A few minutes down the road take the fork to the north leading to the Krafla geothermal plant, which supplies electricity to Akureyri and east of Iceland. It’s a narrow but well paved road and easily walkable. 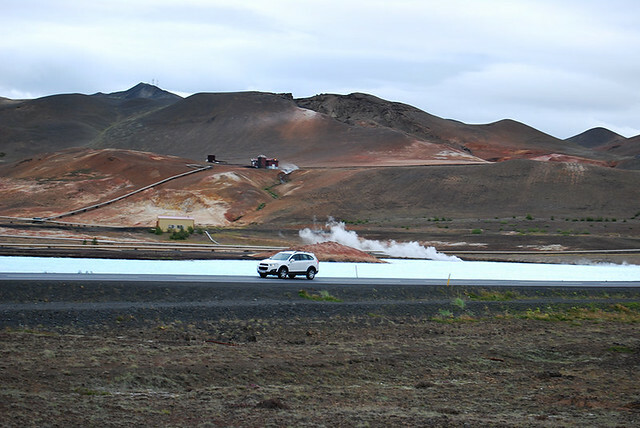 The car can be parked in the plant or in the foot of the crater, where you can find a parking too. 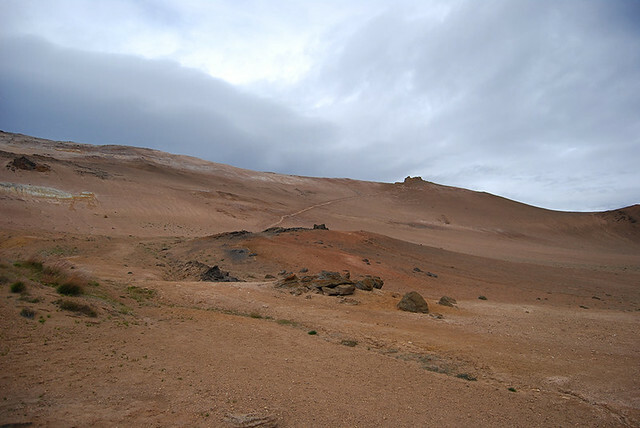 As we still had several walks ahead, we prefered to arrive with the car to the foot of the crater, and from there walk up the mountain and surround the magnificent lagoon that is inside. Leaving the car, a big a loud bang is heard, as a giant chimney expels steam outside. It comes from the plant, but as you don’t see this until you are at the top, the feeling is that it comes from the volcano caldera. We started to climb the mountain, and within minutes I’m out of breath (I have to visit the gym more). From down the slope didn’t seem so pronounced, and wind in the top forces you to hurry to avoid falling into the wrong side: maybe falling in the crater wouldn’t kill you at all, but the water in the pond is not a highly recommended place to get. Once you climb to the the view is spectacular: a post-apocalyptic landscape of mountains of reds and blacks, where you don’t see any kind of vegetation. Surrounding the crater we also find permanent snow and burning steam vents coming out of the earth, a curious combination of elements. 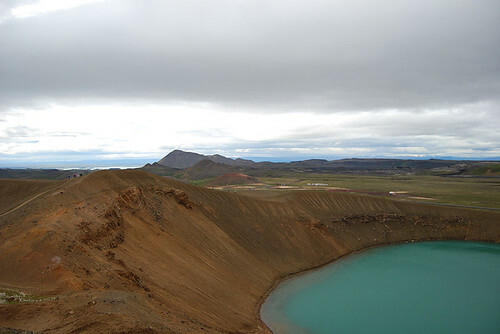 After visiting Krafla we continued our route around lake Mývatn: next stop Dimmuborgir. For those who want to rest a little and take a hot drink, here you will find a café and a small shop with winter clothing and souvenirs. 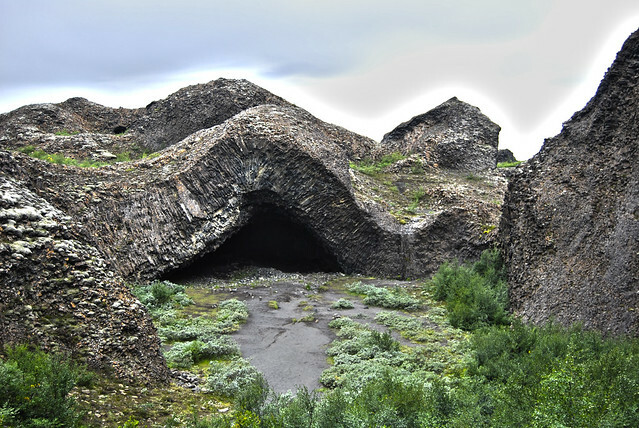 After visiting Hljóðaklettar, the truth is that Dimmuborgir didn’t catch much my attention. It was worth a little walk to see the black rock formations that line the road. 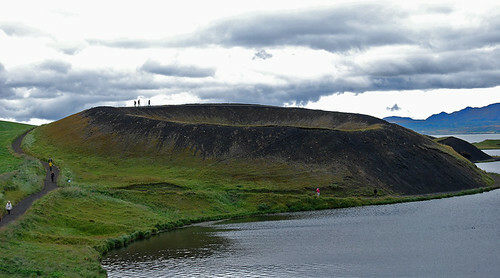 But we took the short way, because like most attractions in Iceland, you can choose excursions with varied durations. The walk was nice; it was the first time in all day that I didn’t feel the cold and bitting wind in the face. The rocks protected us from inclement weather, and besides the sun came out for about 15 minutes. As a curious note: at Dimmuborgir appear elves at Christmas. They are the “Yule Lads”. Here I leave a link which explains who these characters are. The next and last stop we made in Mývatn, Skútustaðir, was touching the lake itself. True to its name, “Lake of Flies”, those pesky insects attacked us just we put one foot out of the car. If it was not because we didn’t want to leave without a stroll by pseudocraters found there, we would have run from that place. We arrived tired and eager to prepare a succulent and well deserved dinner at the cabin. We had to recover for the next day. I would have stayed longer in the north, but the days we would be in the island were very few, and we couldn’t miss some places if visiting Iceland. So we took the road back to Reykjavík. interesting and beautiful! Thanks for sharing your trip! Thanks for your comment Greta!